People with the following conditions have reported that therapeutic massage has lessened or relieved many of their symptoms. 1. Field, T., Hernandez-Reif, M., Seligman, S., Krasnegor, J., Sunshine, W., Rivas-Chacon, R., & Schanberg, S. Jrnl. Ped. Psychology, 1997. 2. Field, T., Henteleff, T., Hernandez-Reif, M, Marting, E., Mavunda, K., Kuhn, C., & Schanberg, S. Jrnl. of Ped., 1997. 3. Sheon R.P., Postgrad Med., 1997. 4. Weintraub, M. American Journal of Pain Management, 1992. 5. Meek, S.S., J. Nurs. Sch., 1993. 6. Klauser, A.G., et.al. Z. Gastroenterol, 1992. 7. Puustjarvi, K., Airaksinen, O., Pontinen, P.J. Acupunct. Electrother. Res., 1990. 8. Ironson, G., et.al. Intl. Jr. Neurosc., 1996. 9. Richards, KC., Am J Crit Care, 1998. 10. Danneskoild-Samsoe, B., et.al. Scand J Rehab Med., 1982. 11. Scafidi, F.A., Field, T., Schanberg, S.M. J. Dev. Behav. Pediatr., 1993. 12. Crosman, J.L., et.al. Jr. Orthop. & Sports Phys. Th., 1984. 13. Goats, G.C. Br. J. Sports Med., 1994. 14. Field, T., Ironson, G., Scafidi, F., Nawrocki, T., Goncalves, A., Burman, I., Pickens, J., Fox, N., Schanberg, S., & Kuhn, C. Intl. Jrnl. of Neurosc. ,1996. Therapeutic massage sessions are setup quite differently from a spa massage. The setting may be a clinic, hospital or private practice office. A first time client may spend extra time at his or her session to complete a very thorough intake form detailing current and past health complaints. This type of session may retain a large relaxation element to it but advanced techniques are likely to be used for pain and chronic health issues. A therapeutic or clinical massage practitioner will see a client very frequently for the first few weeks or months. This might include half hour massages three times a week, or weekly hour massages for a couple of months. Advanced techniques such as deep tissue massage and trigger point therapy may be used in a more clinical setting. It shouldn't hurt, but it's likely to be a bit more uncomfortable than a classic Swedish massage. You should always feel free to speak up if the pressure is too much for you. It's important to be realistic about what one massage can achieve. Many people ask for more pressure, thinking that if the therapist just pushes hard enough, they can get rid of all their knots in an hour. This just won't happen. In fact, undoing chronic knots and tension built up over a lifetime is best achieved with an integrated program that includes exercise, work on your posture and ways of moving, relaxation techniques and a regular program of massage. But a trigger point is more than a tender nodule. It affects not only the muscle where the trigger point is located, but also causes "referred pain" in tissues supplied by nerves. Swedish massage is the most commonly offered and best known type of massage. It was developed by a Swedish physiologist, Henri Peter Ling at the University of Stockholm in 1812. It uses a firm but gentle pressure to improve the circulation, ease muscle aches and tension, improve flexibility and create relaxation. The therapist generally uses massage oil to facilitate making long, smooth strokes over the body. Swedish massage is done with the person covered by a sheet, a technique called "draping." One part of the body uncovered, massaged, and then covered up before moving on to another part of the body. 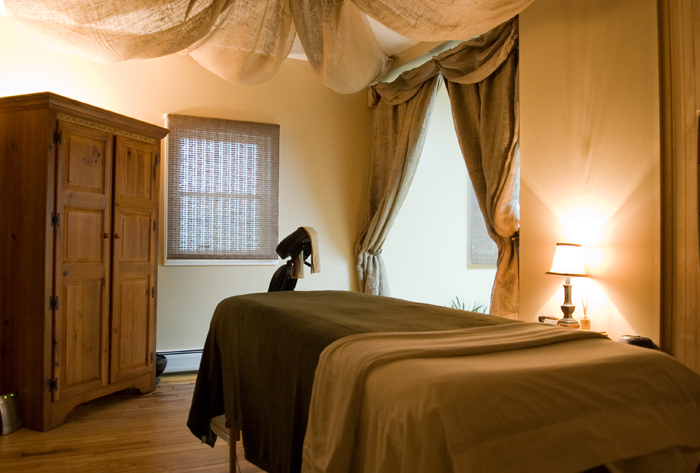 Swedish massage is the foundation for other types of Western massage, including sports, deep tissue and aromatherapy. Reiki is an Eastern healing tradition whose purpose is to re-balance the complex energy systems that compose the body when they have become out of balance. In this tradition, people are considered to be surrounded by an unlimited universal energy source from which the physical universe is built. The energy systems in the healthy body are in balance, but they can be disrupted by stress, and this unbalancing may have physical manifestations such as pain. The Reiki practitioner is trained to channel energy from the universal energy source, which flows through his or her hands to the body of the receiver. The result is the re-balancing of mind and body, the strengthening of body and spirit, the opening of energy blockages, the creation of a sense of well-being, and the healing of illnesses. Reiki sessions are generally held in a quiet setting in comfortable surroundings and may be as short as 5 minutes for treatment of a specific part of the body or as long as an hour or more for a full-body treatment. According to David Palmer, co-developer of the first massage chair and founder of the TouchPro Institute in San Francisco, most office-related physical symptoms can be attributed to loss of circulation. Tight muscles caused by stress and sitting behind a desk all day, especially at a work station that is not ergonomically designed, can impede blood and lymph flow through the body. The result is mental fogginess, decreased energy and susceptibility to repetitive stress injuries, like carpal tunnel syndrome. Chair massage counters the circulatory problems inherent with office work—and provide a appreciated break for employees. Sitting in a massage chair opens up the back muscles, relieves strain on the neck and provides a gentle respite for eyes usually glued to a computer monitor. Even 15 minutes of massage to the neck, back, arms and hands can increase circulation, returning energy levels and helping keep the body injury free. Touch for Health is a holistic approach that uses acupressure, massage, and touch for the purposes of reducing physical and mental pain, improving postural balance, and alleviating tension. Facilitated Stretching is active-assisted stretching, which uses active motion and isometric work to improve flexibility and enhance motor learning in the process.